As a custom former, Freetech Plastics Inc. will go out of its way to “break the mold,” in a manner of speaking. Freetech specializes in manufacturing pressure-formed parts. In addition to the medical industry, the company also serves the electronics and telecommunications markets. “Medical and scientific testing equipment are the driving force of what we do. The adaptation of pressure-formed covers by the telecommunications industry over the past five to seven years has also made that a nice piece of business for us,” Freeman says. The company is a “West Coast-style” pressure former, as opposed to forming products along the “Midwest/Chicago style.” Explains Freeman, “The Midwest style is generally for higher volume, and the color and texture are molded into the part. You also find the shapes formed are not nearly as daring due to the constraints of the (molded in texture) process. Pressure forming is a thermoforming process similar to vacuum forming, but with a high-pressure air assist to allow for better part definition. The part’s appearance is comparable to those manufactured via structural foam or injection molding, but with a lower tooling cost. 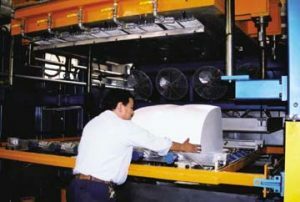 Pressure forming is used to manufacture a wide range of parts, including: interior and exterior automotive components, truck bedliners, medical and computer enclosures, equipment housings, lighting lenses, etc. The most commonly formed material is ABS, followed by polyethylene. Run size on the parts is generally between 100 and 1,000, although higher volume runs can be cost-effective if using a high-speed press. Also, as the part size increases, the process becomes more price-competitive with injection molding due to the latter’s higher cost for molds and possible process restrictions due to a part’s large size. Pressure forming was used to manufacture the tilt and swivel LCD display and on the interior panels that support the laser and umbilical cables for transport. The Star Medical Lightsheer is used for hair removal. “On the West Coast, however, because of the lower volume, it’s not always cost-effective to mold in the texture. Painting is sometimes more economical as the parts are often matched to sheet metal, especially in the electronics and medical industries. Also, the industrial design firms want dramatic eye-catching looks. This style permits more severe draw ratios with deeper undercuts — just more overall design pizzazz,” he explains. Today, four formers are used at Freetech, including a state-of-the-art Modern machine with an 80-inch by 60-inch blank. The Modern also features a unique two-mold forming system with side-by-side pressure forming capability and the ability to perform twin sheet forming, Freeman says. In the 6,000-square-foot thermoforming area, Freetech also uses older model Dripol, Comet and CAM formers. A fifth machine, a rebuilt Modern/Brown former with a 60-inch by 120-inch capacity, 80 to 100 psi across the platen and twin sheet forming capability, is scheduled for installation this month. Due to the lower run requirements generally associated with pressure forming, tooling is typically made from aluminum. At Freetech, product runs range between 5,000 and 10,000 on the high end, down to just a few items. Surgery covers, for example, are manufactured in runs of 50. “Because of the rapidly changing nature of Silicon Valley products, the runs tend to be lower than what you might find in other areas of the United States,” Freeman says. Freetech works on a pull order system for high-volume items; parts are produced for stock and shipped to the customer as needed. Lower volume items, such as medical equipment enclosures, are generally produced in kits on a just-in-time basis. This cover for internet hookup equipment is routed on the left table of the Motionmaster CNC router. Another job will be run on the table to the right. To produce the complex designs, Freetech combines 3D CAD/CAM programming and CNC machining to develop the precision tooling needed to make the high-tech products. 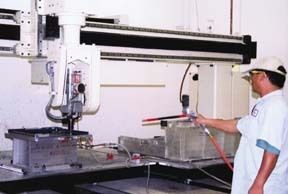 According to Freeman, Freetech has been heavily involved in CNC machining for more than 20 years and was one of the first in its area to specialize in the trimming of thermoformed parts on three-axis machines. Value-added machining continues to be an important part of the custom former’s business. Freetech Plastics Inc. has won numerous awards for its dramatic-looking designs manufactured using the West Coast style of pressure forming.Freetech was a previous winner of the SPE Thermoforming Division’s People’s Choice Award for its work on The Coherent Ultrapulse Laser used for ophthalmology and plastic surgery. Freetech pressure formed the six covers which enclose the unit.The company also won both the Best Medical Enclosure and the People’s Choice Awards from the SPE Thermoforming Division for its work on Intuitive Surgical’s Da Vinci Robotic Surgical Workstation. The workstation earned numerous other design awards including one from the Chicago Museum of Modern Art.A collaboration between Freetech, Intuitive Surgical and Lunar Design, the workstation uses a cast aluminum base and tubular frame with a sheet and metal infrastructure. Pressure forming was used for all the exterior covers.The rear cover encased the power supply and connections for controlling the surgical tools. 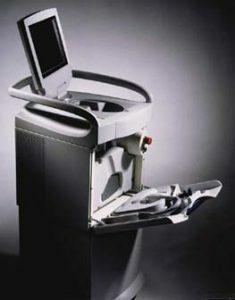 The forming molds used both pneumatic slides and removable inserts to form the undercuts and negative draft features.The upper left and right cosmetic panels also enclosed the surgical controls. Since the surgical console can be used to perform long complex operations, a return radius was formed on all edges on the inside of the covers.The top viewer cover interfaced ergonomically with the surgeon. It also covered dual medical monitors and the other electronics that provided for the 3D image which the doctor saw.Machined trimming was done on five-axis CNC routing equipment using the 3D CAD files to make holding fixtures. “Custom formers provide value-added products very often at price points that no other process can touch until very high volumes are reached. For example, here at Freetech, we spend more time machining each of our parts than we spend on the initial pressure forming,” Freeman says. In the 9,500-square-foot fabricating and machine shop area, Freetech utilizes four Fadal five-axis CNC machining centers with a ±0.0001 repeatability as well as a Motionmaster dual table, three-axis CNC router. The company plans to purchase a CMS CNC router in the near future. “Both medical and scientific testing equipment, as well as computer and rack mount gear all need close tolerances for fit and function capabilities. The customer doesn’t want to deal with returning a product that costs $1 million because the $200 to $300 cover doesn’t fit properly,” Freeman says regarding the importance of high tolerance machining. Due to the nature of its business, Freetech primarily uses ABS, including Spartech’s Royalite R59 which meets low smoke and low heat release requirements. The company typically purchases its sheets already cut-to-size, although Freetech does have a vertical panel saw for cutting larger stock. Painting and decorating are outsourced. “High-quality painted parts will always exceed the appearance specifications of injection-molded parts because there are no sinks, parting lines or any of the other surface characteristics of injection molded parts. This gives the customer both a dramatic look for the product and a Class-A finish along with a cost saving that thermoforming offers over injection molding because of the higher tooling cost,” Freeman says. Freeman has spent much of his time touting the benefits of thermoforming over other forms of molding. He has spoken before audiences on numerous occasions on behalf of the SPE Thermoforming Division and has published articles on the pressure forming process. “I firmly believe in promoting the whole thermoforming industry and educating the design and manufacturing community on the benefits of using these products. As the saying goes, ’The rising tide floats all boats,’” Freeman says. ”Thermoforming is the last of the ‘black arts’ of the plastics business because so much of it has been considered magic,” he continues. “It’s more than just closing the mold and shooting in plastic resin. It is still a craft, but is becoming more of a science.